This online M1 practice test, with multiple choice questions, is intended to help you prepare for the Ontario Motorcycle M1 Test that is required before you can get your Motorcycle driver’s license. This free Ontario motorcycle test is a lesson that is essential for getting your Ontario M1 driver’s license at your local licensing office. Please note, however, that this is not the actual test, and you will not receive your license if you pass this sample practice test. If you’re getting your Motorcycle License, you’ve come to the right place. It is all FREE! Try these multiple-choice M1 practice test Ontario before you take the actual motorcycle written knowledge test. This motorcycle and moped M1 written test is just for practice. Get instant online access to over 300 practice questions. Get tips and motorcycle practice test questions to help you prepare for the Ontario M1 motorcycle knowledge written test. The free licensing exam (M1 License Test) is in multiple choices format, prepare yourself for the written exam. To qualify for a motorcycle learner's license in Ontario, you must. be 16 or older, and; pass a motorcycle knowledge test that is M1. The Ontario requires that all applicants must pass a written motorcycle knowledge test (M1 Test Ontario) on traffic signs and safe driving. We offer free online resources to test yourself on the questions that may come up in the test. Free practice test question for Ontario M1 Test. The motorcycle permit test is not that difficult to pass, if you prepare for it by taking the motorcycle knowledge test practice you should be ready in few days. In Ontario, one must successfully pass a written knowledge test in order to begin the process of obtaining a motorcycle license. This doesn't have to be a stressful time but much rather an exciting one. 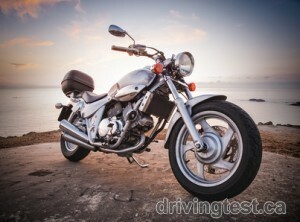 The journey to driving begins after you pass your Motorcycle Knowledge Test. Here is some helpful information to take into consideration when preparing for the knowledge test. Study the Motorcycle Handbook. You can obtain these at any driver's license office or download from this website. They provide a lot of helpful information which you will see on the test. Take notes, highlight, make flashcards and have somebody quiz you. It will make your studying easier if you are already familiar with the material. Take M1 Practice Test. These tests are a great way to see where you stand and what you already know. You will know what areas you need to focus on while you are studying your handbook, whether it's the rules of the road or street signs. Study... Just like any other test you will definitely need to study. There is no way one could pass without putting some serious studying and focusing. There is a lot material on the test so investing your time in studying will never be bad. Take and Retake the M1 practice test prior to your real test. This will help you point out any areas you may need to cram last minute. You will also feel more sure about yourself when you walk in to take your test. Being prepared is always a good thing. As long as you prepare yourself properly you should have nothing to worry about. If you studied hard you should expect a positive outcome. A good night's sleep and a healthy breakfast wouldn't be a bad thing as well. For more information on our practice tests, obtaining a driver's license or any other information contact us today!